Add just enough fertilizer, and crops thrive. Add too much, and you may end up with contaminated surface and groundwater. Excess nutrients from farms can be transported to groundwater reservoirs by water starting at the surface and flowing through soil. But the flow of water through soil is a "highly dynamic process," says Genevieve Ali, a researcher at the University of Manitoba. "It can vary from year to year, season to season, or even rainstorm to rainstorm." It can also fluctuate depending on soil type and even if organic additions, like manure, are applied. Ali is lead author of a new study that shows water infiltrates deeper into cracking clay (vertisolic soils) when liquid hog manure is applied. The study also showed that even though water infiltration went deeper in the presence of manure, it did not reach depths of 39 inches (100 cm). That's how deep tile drains-designed to remove excess subsurface water-are typically installed in the study region. "This observation challenges previous studies, which showed that cracks in clay soils can promote the travel of water and associated contaminants from the soil surface into tile drains," says Ali. "Our study suggests that not all clay-rich soils behave the same." The researchers focused on vertisols because they are present in large regions of North America. "They are common in agricultural plains, where excess nutrients may be common due to intensive farming," says Ali. But knowledge gaps remain about soil water flow in vertisols, especially with organic additions. Water can flow through soil in different ways. 'Matrix flow' occurs when water moves slowly through tiny spaces between soil grains. 'Preferential flow' takes place when water travels relatively quickly through bigger channels, called macropores, such as cracks and earthworm burrows. "Imagine a bucket of sand with plastic straws inserted throughout," says Ali. "If you dumped water on this sand bucket, the water traveling through the straws would reach the bottom first." Similarly, preferential water flow through soil macropores can carry contaminants quickly from the surface down to groundwater reservoirs. Macropores are often connected to one another. "They act like a network of pipes, and they can be created or exacerbated by human activities," says Ali. "Knowing when and where there is preferential flow and how to manage land in those areas is critical to preserving groundwater quality." Clay-rich soils–such as vertisols-tend to crack, which creates macropores. "That makes these soils natural candidates to study the relative importance of matrix and preferential flow," says Ali. This study was conducted in research plots in Manitoba, Canada. 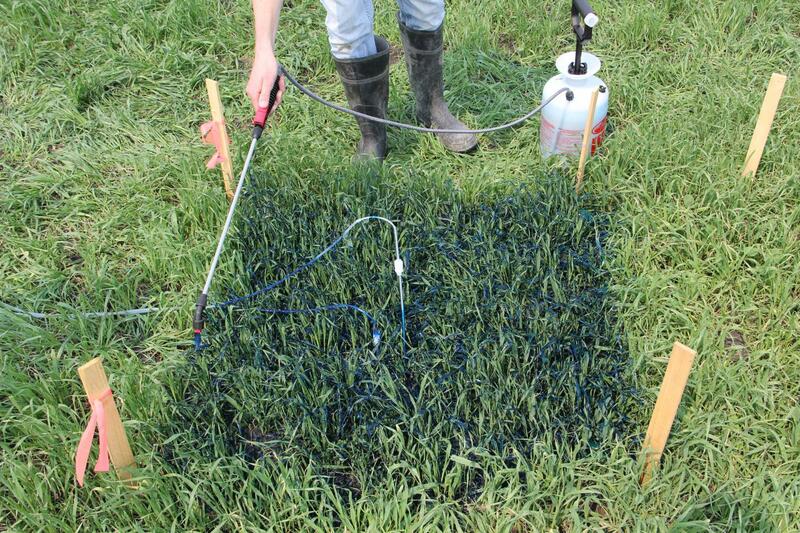 Researchers added liquid hog manure to one plot but not the other. They sprinkled water mixed with blue dye on both plots to determine how water moved through the soil. In the plot where manure was applied, water reached up to 25 inches (64 cm) into the soil. In contrast, water reached up to 18 inches (45 cm) in the plot where manure was not applied. Both plots showed evidence of matrix and preferential water flow. The researchers also found that the water moving through the macropores was not completely separated from the rest of the soil. "If you think back to the analogy of the sand bucket with the straws in it, the straws have a bunch of small little holes in them," says Ali. "Water can be exchanged laterally between the macropores and the surrounding soil." Lateral exchange has been reported frequently for smaller macropores in forested soils, says Ali. "But it is less common in agricultural soils where cracks tend to be larger." This study focused on a single site, so Ali says that further research is needed before generalizations can be made.